Whew. In addition to mowing the lawn* I managed to finish that fat stack of 7 hedgehog/ moleskin notebooks I've been sitting on for close to 2 weeks. The elastics and envelopes went in in no time and pressed for a few hours. 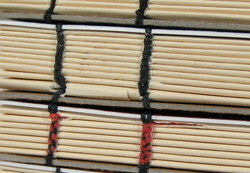 In that time I glued 6 more blocks into leather covers. I pulled the finished books out of the press, signed and dated them, stuffed business cards in the pockets and then shot pictures. Edited said pictures and then listed all the items to my artfire shop. It went smoothly and everything looks good. Thursday I visited my friend in Swampscott and she had been hoarding some paper and advertising posters for me. I walked away with 20 or so posters and about 2 reams of paper. 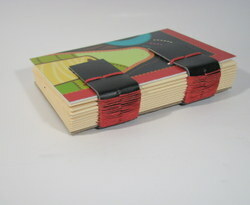 I'll be able to use the guillotine to chop them up into nice matchbook notebooks. The posters are already chopped to size and will be stored until the next time I make a big batch of jotters. I also got some plastic posters that I use for jigs. 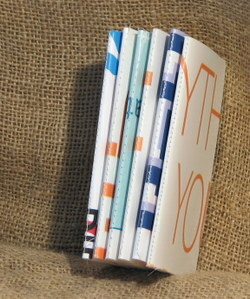 I set up a jig to make covers with some of the left over scraps as the spine with some great backer board as the cover. I picked up some 30×40 sheets of backer board at the Charette clearance sale in Woburn.So I'm going to try out some new books and stitches. Fun stuff planned. Tomorrow I'm headed to Western Mass to help a friend set up an ArtFire and an Etsy shop. I"ll spend the afternoon testing out my skillz. *no small feat considering that it's rained every weekend for the last 3 weeks and I've not been able to mow for that whole time. The grass was halfway to my knees and I"ve got an electric lawn mower… It wasn't pretty. 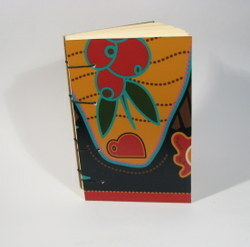 This entry was posted in Uncategorized and tagged artfire, binding, books, glue, journals, leather, sketchbook on 20090627 by leslie. 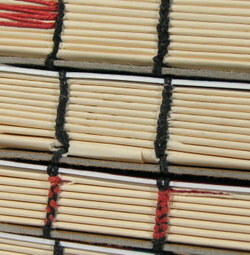 hole stitch and a single sheet of paper folded. Hey Lucy's instructions are the easiest and could be adapted to anything you want, but I like the Stanford, though stuffy, it's shear amount of information and 2 signature options a the best for the art journaler. This entry was posted in Journaling and tagged art, binding, book, create, draw, journal, lifebook, response, signature, single, suziblu on 20090117 by leslie. of plastic and the other typical vinyl coated ad glued to thin foam core. Coptic stitching to use these posters. saved from packages of tags also from work. I would have been able to simply remove the bad signature and attach the cover. Ah well. See some pictures of my mistakes below. do a loop and pack I didn’t pack as I had intended. Go figure. combination and the dense heavy stitching is fantastic as well. stitching is all done with hand waxed Irish linen thread, unbleached but dyed. on eBay as a set. Or maybe something fun. 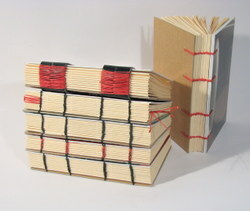 This entry was posted in Uncategorized and tagged art, binding, book, bookbinding, craft, handmade, journal, lifebook, recycle on 20071220 by leslie.